A wonk's-eye view of everything in the sky. Today I’m reading Grounded: Frank Lorenzo and the Destruction of Eastern Airlines , an on-the-ground account written in 1990 by reporter Aaron Bernstein about the events surrounding Lorenzo’s ill-fated ownership of Eastern in the ’80s. (FYI: Bernstein takes a clear pro-labor angle that should be noted.) In his discussion of military man, former astronaut, and Eastern CEO Frank Borman’s actions preceding the sale, many of those whom Bernstein interviews thought that Borman was too proud to let his airline go into bankruptcy or sell it to corporate suitor Frank Lorenzo. “Borman had no desire to sell the company,” writes Bernstein. “Failure would be a bitter end to what had been a successful climb to the top of the corporate ladder.” But Borman ends up running to Lorenzo instead of buckling to union pressure. I’ve written before about the decreasing stigma of bankruptcy. If the law is too heavy a cudgel to ensure upright behavior by airline bosses, and if bankruptcy judges see fit to allow airlines to shred contracts under what Herb Kelleher calls the “health spa” of Chapter 11, then we will have no choice but to shame the executives into doing the right thing. Does the American public have the moral stamina? See this and other revenue-generating strategies airlines might employ in this week’s edition of The Onion. I like the comment that short flights congest airports as much as long ones. I’m of the opinion that a carbon pricing scheme would give a boost to rail travel over both driving and short-haul flying. But a potentially more important factor in some regions might be the runway congestion charges under consideration. I suspect that auctioned spots would tend to go toward long-distance flights, for which there are few good substitutes (question to the gallery: what are the high margin flights — where do airlines make their money?). Were that the case, demand for regional rail should significantly increase. You’ve read a lot in the past few years about airlines “shifting” to “more profitable” overseas routes, but that doesn’t quite express what’s going on. Airlines are maximizing their yields, and business-traveler-oriented long-haul international flights often have better yields than leisure-class runs to Vegas or Orlando. But the long-hauls are not necessarily high-yielding on their own, but because they access feed traffic from lots of smaller markets. AP is reporting that merger talks between United and US Airways have broken down. At least one disaster is now averted. UK Competition Commission leaning toward breaking up BAA; will Heathrow be set free? The UK Competition Commission (CC) will likely recommend that BAA Ltd., the commercial owner-operator of London’s three primary airports, be forced to sell at least two of them. The CC signals this strong leaning in its “emerging thinking” document published on April 22. The CC is in the middle of an investigation of whether BAA’s ownership of seven UK airports, including the three largest in the London area and the two largest in Scotland, creates adverse effects on competition. It took up the investigation in spring 2007 based on a referral from the Office of Fair Trading. First, some background: several British airports were once run by the British Airports Authority. In 1986, as part of the Thatcher government’s privatization program, the agency was spun off as BAA plc (today BAA Ltd.) The government held a “golden share” in the firm until 2003, when the European Union ruled against it; in 2006, BAA was bought by Ferrovial Group, a major European airport infrastructure business. BAA both owns and operates seven British airports: Heathrow, Gatwick, and Stansted near London; Southampton; and Edinburgh, Aberdeen, and Glasgow in Scotland. It’s gotten in trouble lately for a failure to keep up with demand at Heathrow, with needed new terminals and runways decades from completion. 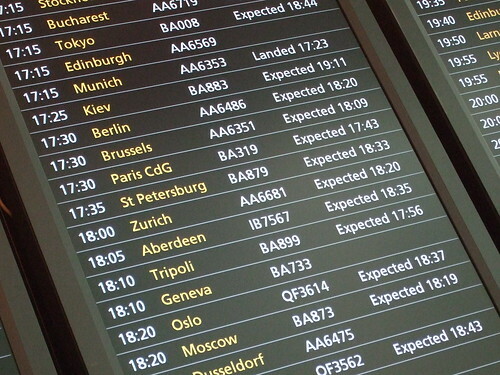 BAA was further wounded by the Terminal 5 opening debacle at Heathrow, and it has been slowly bleeding customers–airlines and passengers–to much more up-to-date, larger, and expansible airports on the European continent. BAA’s finances are complicated by the fact that its landing fees are capped by regulation, which is why BAA invests so much in retail and other profitable commercial activity, as you’ll see if you ever wander around a BAA terminal. BAA’s four airports in the southeast of England (especially Heathrow, Gatwick, and Stansted) account for 91 percent of traffic. In its document, the CC considers the extent to which common ownership affects competition, including its affect on responsiveness to customers, infrastructure investment, substitutability of demand, regulation, and capacity constraints and development. Don’t know much about geography. . . In only the most marginally aviation-related news, the final round of the twentieth annual National Geographic Bee will be held today. In honor of the occasion, I have an article on American.com about the Bee and the importance of geography education. America vs. Europe: who overrates whom? The solution to NYC’s airport woes? Let your left hand not know what your right hand is doing…. Banner photo: Washington during landing at National Airport, November 2007. © Rachel Ayerst. Used by permission.